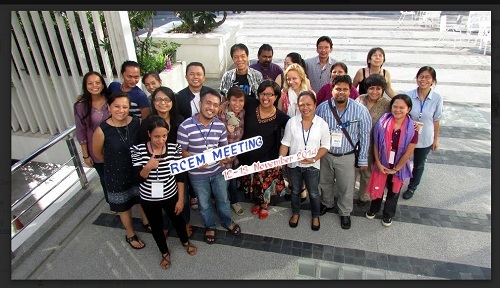 AP-RCEM Constituents refer to civil society organizations (CSOs) affiliated with the AP-RCEM. This means CSOs that agree to the Bangkok declaration, AP-RCEM’s Functional Operations Document, and TOR, submit a profile to the secretariat and self-define the Subregional and Thematic AP-RCEM Constituencies they should be placed in. Constituents may participate in multiple themes and sub-regions (in the case of region-wide groups). But for voting purposes, each constituent can belong to only 1 primary Sectoral Constituency and/or 1 Geographic (sub-regional) Constituency, and provide a copy of registration of the organization. In the absence of such, endorsement by at least one existing member of that Constituency will be necessary. The list of members and their basic information should be available on the AP-RCEM website and readily accessible to anyone interested. AP-RCEM Constituents would be asked to regularly renew their affiliation to the AP- RCEM by submitting an updated profile to the Secretariat every 2 years. To strengthen accountability, ownership and self-organisation, each sectoral and sub- regional constituency will propose, elect (or select by consensus as may be decided by the constituency) their own Focal Point. The Focal Point position is organisational instead of individual, but each organisation should assign one main contact person, and one alternate (alternates may be identified from a different organization if necessary). They should be willing to serve for a term of two years. Note: there will be handover period of 6 months from the former to the new Regional Coordination Committee. 1) Preferably regional and national organisation with working scope in Asia and Pacific, or international organisation with regional (Asia Pacific) office with most of the board coming from Asia and Pacific. 2) For sectoral constituency focal points, priority will be given to member-based organisations, the majority of whose members belong to that particular sectoral constituency. 3) Organisations should have interest, capacity and experiences in coordinating the CSOs in Asia Pacific in general, and within their constituencies, particularly in building common positions and facilitating collective decision-making processes. 4) Organisations should have the capacity and commitment to fulfill the responsibilities and task as constituency and sub-regional focal points as mentioned below, each organisation should assign 2 contact people (1 main, and 1 alternate) to coordinate the constituency. 5) The organisation should have an established office or address (called e.g. headquarters/secretariat) with an executive officer. It should have statutes which are transparent and accessible and if a network preferably a democratically adopted constitution. In addition to the general criteria, constituencies can propose additional criteria, given they are arrived at by consensus within the constituency. All focal points will constitute the Regional Coordination Committee which will be collectively responsible for facilitating and coordinating the work of the entire RCEM. 1. Information: Sharing information on the post-Rio+20, Post-2015 and related processes and the AP-RCEM to CSOs in the region and feeding back information from constituencies to the AP-RCEM as a whole. 2. Outreach: Inviting CSOs from the various constituencies to engage the post- Rio+20 , Post-2015 and related processes through the AP-RCEM. sub-regional and/or constituency positions and recommendations through thematic working groups related to sustainable development/Post-2015 agenda whenever possible. and international processes in order to bring regional positions and perspectives related to sustainable development, while ensuring that such engagement is relevant to advocacy, education, organizing, mobilization and/or other related work of members at the national level. collection and systematization of recommendations from the participants on how to improve the functioning of the AP-RCEM. 7. Resource mobilization: Raising funds for all of the above and ensuring transparency and accountability to our constituencies. An Advisory Group (AG) consisting of individuals that have extensive knowledge on sustainable development and civil society engagement supports the work of the RCC. Individuals recommended on the basis of their expertise by the Co-Chairs and/or RCC and subject to confirmation by a consensus of the RCC will constitute it. The AG’s role is to contribute to the full realization of the aims and vision of the AP-RCEM. They shall provide timely advice and assistance to the RCC as requested by the Co-Chairs. They may be invited to deliberations but are not part of decision making of the RCC. The number of AG shall not exceed 25% of the number of the RCC. Necessity and composition of AG is subject to periodic review. Thematic Working Groups are ad hoc cross-cutting groups of Constituents that come together temporarily to work on a specific issue or prepare for a meeting or specific engagements. They are initiated by posting a thematic concept on the RCEM website and they need to assign one coordinator, who reports to the RCC and makes it available online in the same fashion as regular reporting. The role of the TWGs is to develop common positions or messages for sustainable development processes in the region where possible on specific themes. It will be composed of volunteers from the various sub-regions, constituency groups and experts. Membership in them is voluntary and based on expertise or interest, rather than representation. Functional working groups can also be formed to perform particular tasks necessary for the effective and efficient operations of the RCEM such as communications, etc. Three (3) Co-Chairs will provide leadership for RCEM. The RCC members will nominate from amongst themselves (self-nominations allowed) and consensus must be reached within the RCC. The Co-Chairs shall convene the meetings of the RCC, prepare reports of the RCC to the AP-RCEM membership, and represent the AP-RCEM in liaising with external agencies.